Vital MX: Summer is upon us and so are the latest motorcycles. Husqvarna has dropped us a load of info this morning, so here's the details on the 2018 models...including their mini and two-stroke line. Motocross is synonymous with the very culture and history of the Husqvarna motorcycle brand. With over 100 years of continuous production, developing some of the world’ s first production off-road machines, Husqvarna are truly the pioneers of the sport as we know it today. Husqvarna Motorcycles continue pioneering cutting-edge technologies by developing motorcycles that are more agile, more powerful and more ergonomically advanced than previous generations. The attention to detail and innovative techniques used by Husqvarna engineers have resulted in continued development year-on-year, delivering premium products to the motocross market. In model year 2018, Husqvarna Motorcycles look to continue their century-long success and maintain their position as one of the leading players in the segment. To achieve this, they will continue offering motorcycles that are at the pinnacle of performance, design and ergonomics. Featuring seven updated models and an all-new TC 85, Husqvarna Motorcycles’ 2018 motocross range combines cutting-edge technology with high-end componentry to offer riders of all ages and riding levels one of the most efficient and sophisticated motocross line ups on the market. Husqvarna Motorcycles’ 2018 motocross range combines advanced technology with high-tech componentry to set the benchmark in performance and handling. Husqvarna MY18 in one short paragraph Representing a sophisticated line-up of eight premium machines, Husqvarna Motorcycles’ 2018 motocross models offer the ideal combination of powerful engines, Swedish-inspired styling and state of the art technology. Featuring high-tech componentry and rider-focused design, these agile motorcycles are at the pinnacle of performance, design and ergonomics. full-sized motocross machines. Featuring an all-new frame and high-tech WP suspension the 2018 TC 85 will allow junior motocross riders to push their limits with total confidence. A major upgrade to all full-sized 2018 TC and FC machines are the Magura front and rear braking systems. Utilizing a similar layout to the previous design, the new brakes now offer improved sensitivity for an even better feel. Additionally, all 4-strokes receive a new Li-Ion battery. Based on a simple yet distinctive design, new graphics across the 2018 motocross range highlight Husqvarna’s Swedish heritage. Raising the bar in the ultra-competitive 85cc class, the new generation TC 85 features much of the same technology found in the successful full-size Husqvarna motocross line-up. With an all-new frame and state of the art WP suspension, young mini riders can push the limit with total confidence. Featuring a new engine that delivers a broader and more controllable power delivery the new TC 85 offers top-level performance and durability for the stars of tomorrow. Made from lightweight aluminum, the new subframe features a shorter and more compact profile. Overall, the component is now 75 mm shorter and 0.4 lbs (0.2 kg) lighter contributing to the overall weight reduction while also improving mass centralization. Manufactured using a gravity die-cast production process, the one-piece aluminum swingarm offers exceptional strength at the lowest possible weight. For easy maintenance, the chain adjustment markings are visible from above, making adjustment even simpler. Mirroring the latest technology found in the Husqvarna full-size motocross range, the TC 85 features all new WP suspension. Up front, the WP AER 43 consists of a split fork design using a capsuled air spring in the left leg and the trusted oil damping system in the right leg. The new components offer a significant improvement in suspension performance with an increase in wheel travel to 280mm total (+10 mm). Additionally, adjustment is made simpler thanks to the single air pressure valve and supplied air pump for preload and easy access clickers for compression and rebound. On the rear, the TC 85 is fitted with a specific version of the new WP Xplor PDS shock absorber. The design offers improved progression and response that is further improved by lowering the mounted angle by 3°. Wheel travel is increased by 5mm and is 305mm in total. The WP Xplor PDS is fully adjustable for preload, compression and rebound. The TC 85 features a lightweight and strong tapered aluminum handlebar that is fitted with a new throttle assembly for easy free play adjustment. Additionally, the TC 85 is fitted with ODI lock on grips as standard. The system includes a vulcanized grip on the right side while the lock-on grip on the left does not require glue or wire for mounting. 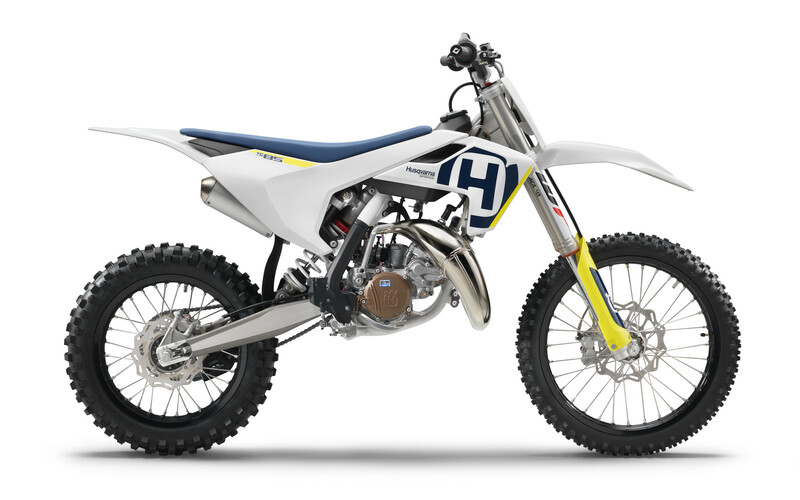 The TC 85 features all-new bodywork modeled after the successful full-size Husqvarna motocross line-up. When scaled down to the proportions of an 85cc rider, the contact points and feeling remain the same allowing the younger riders to feel the same control and comfort found on the larger models. The improved ergonomics instill confidence while leaving room for free and unrestricted movement thanks to the broader and flatter seat and one-piece airbox covers. Durable in-mold graphics accent the bodywork in blue, white and yellow as a tribute to Husqvarna’ s Swedish roots. New radiators produced by WP Performance Systems are designed using CFD (Computational Fluid Dynamics) to ensure the ideal passage of air through the cooling fins. Combined with a revised routing of the coolant circuit, the new system ensures optimum engine temperature for the highest performance in varying conditions. The new radiator protectors not only serve as protection from flying rocks and debris but also serve as a brace diverting energy around the radiators in the event of an impact. The new airbox is designed to offer the best possible performance with the highest level of filter protection. The air filter is easily accessed, without tools, by removing the left side panel. Easy maintenance is guaranteed by the Twin Air filter and filter cage design that features a simple fail-proof mounting system for safe and accurate filter installation. Wheels and tires Black aluminum rims and CNC-machined hubs are fitted with Maxxis tires that deliver outstanding performance on a wide variety of terrain. The pattern design and rubber compound offer exceptional straight-line stability and excellent traction and predictability. A Formula four-piston brake caliper and 240mm wave disc at the front and a two-piston caliper and 210mm wave disc at the rear ensure powerful and confident braking. The piston size on the rear caliper is reduced by 2mm to 22mm and, in combination with a new rear brake lever, delivers improved modulation and feeling. The new exhaust system is perfectly tailored to the new engine’s power characteristics, contributing to the outstanding performance and all-round ride-ability. The header pipe is made in a three-dimensional stamping process by WP Performance Systems. Once the components are shaped they are robot welded to ensure the highest level of quality and durability. The new silencer is 50 mm shorter, improving mass centralization. The new TC 85 engine uses the latest technology to deliver unrivaled performance in the ultra-competitive 85cc class. With an unchanged bore and stroke, the engine delivers improved performance and ride-ability across the full RPM range. Key to the engine is a new power valve, which allows the power delivery to be tailored simply and more effectively than before. The new cylinder has an unchanged bore and stroke (47/48.95mm) with new ports to improve performance and response. Additionally, the new cylinder is designed around an all-new power valve system. The new system controls both the exhaust valve and the sub exhaust port for significantly improved power, torque and controllability. As a result, the TC 85 receives a significant increase in mid-range performance reducing the need to use the clutch in loamy or sandy conditions. An adjuster screw allows the opening time of the power valve to be adjusted to suit rider preference and track conditions. By changing between different power valve springs - available in the Husqvarna Accessories catalogue - the rate at which the power valve opens can be further tailored. The all-new crankshaft is now lighter and features optimized balancing that reduces vibration. Even after removing weight, the rotational inertia of the crankshaft has increased by 0.5kg, improving torque and ride-ability. The crankcases are manufactured using a high-pressure die-cast production process that keeps wall thickness to a minimum while retaining strength and durability. The design of the new cases is more compact and aims at positioning the shaft arrangements as close as possible to the center of gravity for improved handling. As a result, the crankshaft has moved 31mm upwards and 8.8mm backwards. The TC 85 features a new, lighter gearbox. While keeping the same motocross-specific ratios, the shifting action is improved allowing the rider to select the next gear with confidence. Additionally, similar to the footpeg design, a new self-cleaning gear selector prevents the build-up of dirt ensuring complete control in all conditions. Clutch Replacing the previous coil spring design, the TC 85 features a new diaphragm spring clutch. The new design is more compact and also benefits from added durability. The clutch is actuated via a Formula hydraulic system meaning that play is always adjusted and the clutch point remains the same under different conditions and over time. With 40 hp, and an overall weight of just 37.9lbs (17.2 kg), the 125cc engine indicates constant development in 2-stroke technology by Husqvarna. The lightweight engine is designed to provide more torque than current 125cc 2–stroke engines making the TC 125 easier to ride for both beginners and seasoned professionals. Sticking with the overall theme, the TC 125 engine is designed to centralize rotating mass for optimal operation with the chassis resulting in a light and agile handling feel. The cylinder features a 54mm bore. Combined with an innovative power valve design, the 125cc motor embraces every last horsepower the Teflon coated piston can provide. The crankshaft is manufactured to be as light as possible and is balanced perfectly to reduce vibrations. The component is also positioned to ensure that the rotational mass created has very little effect on the handling of the motorcycle. High-pressure die cast production processes keep the overall weight to a minimum, resulting in thin wall thickness. The historical Husqvarna logo adorns the bronze finished crankcase covers. The TC 125 features a 38 mm flat slide Mikuni TMX carburetor. With an updated setting for MY18, the carburetor provides a smooth and controllable power delivery with optimal performance over the entire RPM range. The 6-speed gearbox features specific motocross gearing while the gear lever features an innovative tip design that prevents dirt build-up. The exhaust has been designed to offer optimum performance. Working together with the chassis design it offers the best possible center of gravity and weight distribution. Exhaust - best possible performance with the best handling characteristics. The 250cc 2-stroke engine has long offered the best combination of unsurpassed power and lightweight construction. The simplicity and low maintenance costs of the 2-stroke motor has made it a favorite amongst motocross riders for generations. The TC 250 engine features the latest 2-stroke technology aimed at centralizing rotating masses and reducing vibration while delivering the highest level of performance in its class. The 66.4 mm bore cylinder features an innovative power valve system that delivers a smooth and controlled power throughout the RPM range. This can be further customized by simply changing two springs supplied, altering the power delivery for different track conditions and rider preference. The TC 250 engine is designed with mass centralization as a key theme. As a result the lightweight, die-cast engine casings are developed to house the shaft arrangements in the perfect position, centralizing oscillating mass and improving ride-ability. The TC 250 features a 38 mm flat slide Mikuni TMX carburetor. With an updated setting for MY18, the carburetor provides a smooth and controllable power delivery with optimal performance over the entire RPM range. The TC 250 features a DDS (Damped Diaphragm Steel) clutch. What this means is the clutch uses a diaphragm spring instead of the more common coil spring design, which allows for a much lighter clutch action. This design also allows for a damping system that increases both traction and durability. This combined with the Magura hydraulic system guarantees a light and modular clutch feeling, which is almost maintenance and adjustment free. All major components and shaft arrangements are carefully designed and placed in specific positions that best suit the performance and handling characteristics of the overall package. The 250cc engine is not only light at 57.5lbs (26.1 kg) but also remarkably powerful, offering an overall power output of 46 hp at the output shaft. Outstanding performance - 46 hp peak power and 14,000 rpm rev-limit Cylinder head The DOHC cylinder head features finger followers with a DLC (Diamond Like Carbon) coating, resulting in minimal friction and optimal performance. These actuate large titanium valves (32.5 mm intake, 26.5mm exhaust) that open and close multiple times each second introducing fuel/air mixture to the carefully designed combustion chamber for efficient and optimal power throughout the rev-range. The 78mm bore cylinder houses a forged bridged-box-type piston made by CP. Both the cylinder and piston are professionally engineered from high strength aluminum resulting in outstanding performance and reliability. The crankshaft is designed to offer the best possible performance while being placed in the perfect position to centralize oscillating masses for optimal handling. The plain big end bearing features two force-fitted bearing shells, ensuring maximum reliability and durability and guaranteeing long service intervals of 100 hours. All Husqvarna motocross motors are designed with mass centralization and weight reduction as main criteria. As a result, the crankcases have been designed to house the internal components of the engine in the perfect position to achieve the ideal center of gravity while adding the least possible weight. The casings are manufactured using a high-pressure die-cast production process. The result is thin wall thickness and exceptional reliability. The iconic Husqvarna logo adorns the bronze finished crankcase covers. The 350cc DOHC engine weighs in at only 60lbs (27.2kg) and has a maximum power output of 58hp. The engine is specifically designed with performance, weight and mass centralization as key criteria. As a result, all shaft arrangements have been positioned to allow oscillating masses to occupy the ideal center of gravity while all parts are engineered to offer the best possible performance while adding the least possible weight. The FC 350 features a DOHC design with polished camshafts and DLC coated finger followers reducing friction and improving overall performance. Added to the design are large titanium valves (36.3mm intake and 29.1mm exhaust) that allow the engine to rev freely to the 13,400 rpm ceiling. The 88mm bore and 57.5mm stroke cylinder features a large diameter and lightweight forged bridged-box-type piston by CP. As a result, the relatively low oscillating masses deliver exceptional power, high revs and a very wide power band. A top quality crankshaft is at the heart of the high output, high-revving FC 350 engine. The plain big end bearing features two force-fitted bearing shells to ensure maximum reliability and durability, guaranteeing long service intervals of 100 hours. The FC 350 features an engine design with mass-centralization and weight reduction as the main goals. All the major components have been positioned to achieve the best possible center of gravity. As a result, the motorcycle benefits from superb handling while ensuring a light and compact engine design. High-pressure die-cast production processes keep the overall weight to a minimum, resulting in a thin wall thickness while retaining reliability. The iconic Husqvarna logo adorns the bronze finished crankcase covers. The compact 5-speed gearbox features a low-friction coating on the shifting fork, ensuring smooth and precise shifting. The gear lever features a design that prevents dirt build-up for easy operation in the toughest conditions. An advanced gear sensor allows for specific engine maps in each gear. The 250cc and 350cc engines feature CSS (Coil Spring Steel) clutches with Magura hydraulics and lever. The CSS clutch has six coil springs, seven clutch plates and a one-piece CNC machined steel clutch basket. The SOHC engine is the perfect example of the advanced engineering techniques used by Husqvarna Motorcycles. It offers a peak power of 63hp at an overall weight of just 61.3lbs (27.8 kg). Mass-centralization is key in the engine design, enabling chassis engineers to position the engine closer to the center of gravity for greatly improved handling and maneuverability. The compact SOHC cylinder head has been designed to offer the maximum performance at the minimum possible weight. The camshaft actuates four lightweight titanium valves that weigh only 32g on the intake side and 28g on the exhaust. The diameter of the intake valves is 40mm, while on the exhaust it is 33mm. Low-friction DLC coating on the rocker arm and low-friction chain guides offer optimum efficiency and reliability. The lightweight aluminum cylinder is an engineering masterpiece. Featuring a 95mm bore and a CP bridge-box-type piston that weighs only 320g. The compression ratio is 12.6:1 for an amazing peak output of 63 hp. The inertia produced by the crankshaft is carefully calculated to deliver optimal traction and ride-ability from the powerful 450cc plant. The crankshaft is specifically positioned to harness the rotating mass in the ideal center of gravity, resulting in a lightweight and agile handling feel. A plain big end bearing comprising of two force-fitted bearing shells ensure maximum reliability and durability, guaranteeing long service intervals of 100 hours. The crankcases are designed to house the shaft arrangements and internals of the engine in the position that offers the best possible handling. Additionally, the position of the clutch shaft keeps the clutch above the oil level resulting in decreased friction and increased efficiency. High-pressure die-cast production processes keep the overall weight to a minimum, resulting in thin wall thickness while retaining reliability. The historic Husqvarna logo adorns the bronze finished crankcase covers. The lightweight 5-speed gearbox has a low-friction coating on the shifting fork guaranteeing smooth and precise shifting. The gear lever features a design that prevents dirt build-up and keeps the lever tip in its original position even in the toughest conditions. An advanced gear sensor allows for specific engine maps in each gear. The FC 450 features a DDS (Dampened Diaphragm Steel) clutch. The exclusive characteristics of this system include a single diaphragm steel pressure plate instead of traditional coil springs. It integrates a damping system for better traction and durability. The clutch basket is a single-piece CNC-machined steel component that allows the use of thin steel liners and contributes to the compact design of the engine. So no changes between '17 and '18 for the 4strokes? The TC85 has a battery? I hope that they have room for one and an optional electric start kit. And an ignition map switch. I would like to build my boys Husqvarna TX100's. TC 85 with more flywheel weight, 105cc kit and electric start. Perfect bike for in between 80cc 4 stroke and a 125 2 stroke. That's a typo meant for the FC four strokes I think. THEY got a new battery. I think that's a typo meant for the FC line. "Additionally, all 4-strokes receive a new Li-Ion battery." I would love me a TC250! !